What compound noun does this photo represent? EMAIL your answers and leave a comment designed to either help or confuse your fellow game players. The first contestant to EMAIL me the right answer wins a featured link in my blog which will display until next Monday when we’ll play this little game again. Enjoy. If you wished to be added to or removed from the Punny Monday mailing list, please let me know! You are hopelessly old-fashioned. Computer files always save year first for logical retrieval. Thom, you do year, month, day so the computer can file it properly. That’s how I do my dates, too. Nessa — Thom is Thom. If my router was on after 10:00 pm, I might have gotten this in early enough to be the first correct answer! Well, maybe not. I don’t stay up to midnight or 1 anymore! Kelley — had you stayed up, you would have indeed won — however, by abiding by your own rules and a setting good example for your children, you’ll earn a greater reward. Does it have to do with baked brains? Doug — no haggis. Sorry. Barbara, a compound word is two complete words put together to make a new word, i.e. bookworm, mailbox, football, headphone, etc. Yes, I knew what a compound word was. But I didn’t know if a compound noun could be two separate words (post office) or if it had to be one word. I looked it up after I answered, and a compound noun can be either way, whereas a compound word is indeed just one word. Well, you just taught me soemthing new! I will be more careful how I label these! I sent you a guess. I hope that it is at least a compound noun. I’m not quite sure, if I got the definition right ;). Have a wonderful week. Thanks for another great Punny Monday. Rosidah — you made the winner’s list! A little faster and you could have been the over-all winner. Wow, I didn’t expect that! Loved to read the explanations about compound noun and word. I have learned something new here. Thank you. Of course, reading all the answers and comments is one of the highlights, too. Amoeba is looking pretty phoney there! Linda — I thought this one was easy, and this is kind of funny since Amoeba is one of the most genuine people I know! 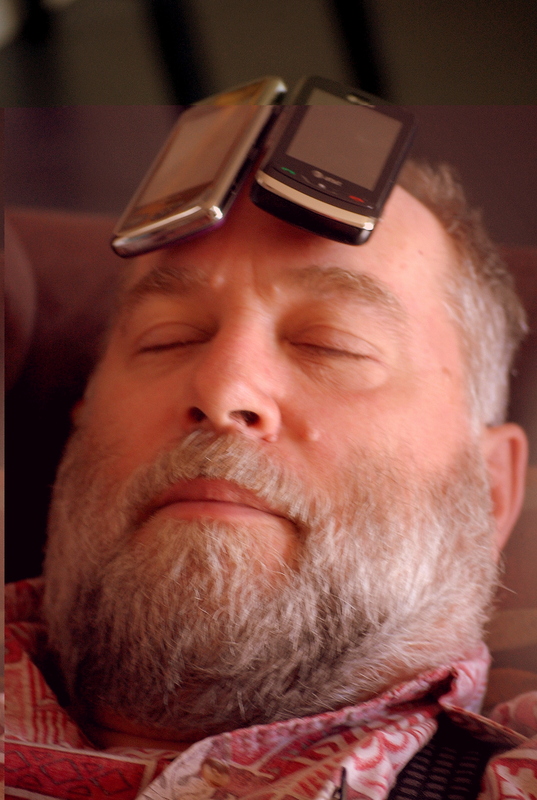 My phone gives me a headache sometimes too…. Melli — Amoeba really doesn’t care for his, but I am in love with mine! Oh… I completely missed the part about a compound noun… lol… Nope… I’m sure my guess is NOT correct! Melli — you[‘re right, your guess was WAY off. NO KIDDING! I couldn’t have been MORE off if I tried! But honestly… Head Phones would have NEVER occurred to me! That compound word is not EVEN in my vocabulary! I hate the things! I think it is a modern way for meditation ! This is a participant hunting ! Gattina — all that ring would break the meditation spell don’t you think? And my weekend was boring! dude’s not sexting, is he? or is he doing like carl sagan? Kitty — searching for extraterrestrial life with a cell phone … sounds like a science fiction novel plot. I don’t even have a guess for this one! Mama Zen — but this one was easy! You’re thinking too hard! IPhone applications is my favorite wrong answer this week. Doug — it was funny, even if we were applying LGs. Oh, I like brain cells, too. Doug — I somehow suspect that if I had told Amoeba I needed his brains exposed for my PM shot, I would have had a bit of a struggle getting him to comply. Oh dear… I missed punny Monday. Don’t think I’d have gotten this one, so at least I missed one I didn’t have a chance at solving (i’m out of the wireless/cell phone loop, I’m afraid. Raven — I just stepped up into the world of text and email on my phone. Fun! I think all of the answers are valid. Nessa — I’m certain everyone else in your category agrees. Oh, now that I see the answers, I like Thom’s much better than the correct one! Kelley — that was my favorite, too and I wished I had thought of it first. Carletta — well, your answer was logical at least (but don’t tell Thom I said that!). I stared at this picture for nearly 5 minutes and still didn’t come up with anything! Apparently my brain just does not work this way. I would NEVER have gotten it — and I’m so glad I didn’t try because I would have been a “Ding-a-Ling”, definitely!